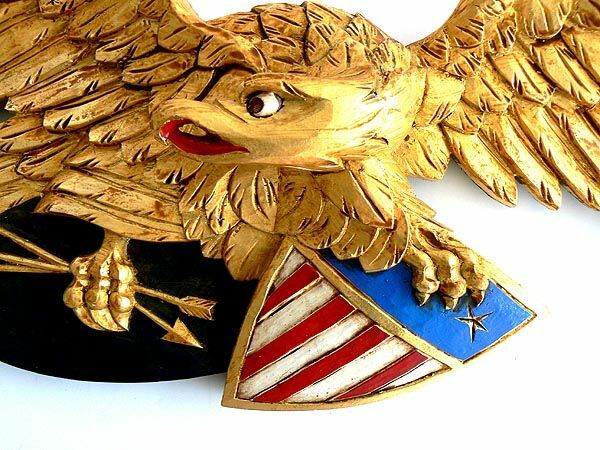 To view a large 44 inch vintage eagle by the Artistic Carving Company of Boston, click here! 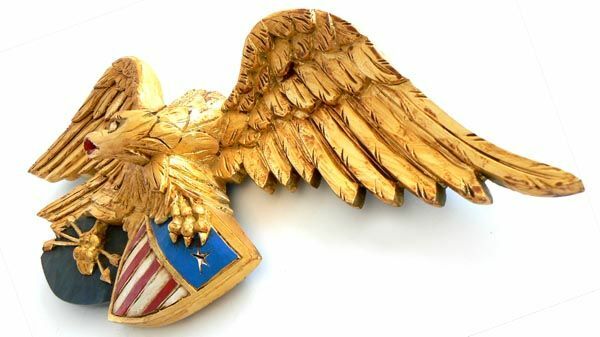 This fine carving of an American Spread Eagle is distinctive in that it is almost a reverse image of the ubiquitous eagles by John Bellamy and copied by the Artistic Carving Co. It is refreshing to find a fine carving that is very much the work of a skilled artisan whose attention to detail is exceptional, and does not appear to be the work of John Bellamy or the Artistic Carving Co. of Boston. 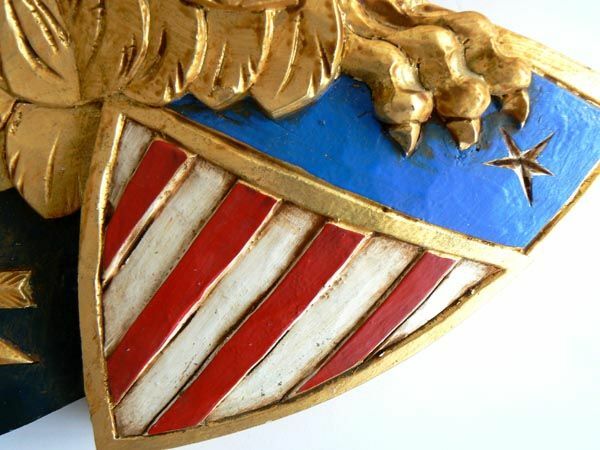 In the same context t he shield of the United States is shown on the viewer's left, rather than the more prevalent right with three arrows clutched in his left talon. There is only one star showing in the upper left of the shield, the others covered by feathers and the talon holding it. The eagle has a rather fierce expression and the manner in which the shield and arrows are gripped is protective. The feathers are carefully detailed and incised. There is a hole drilled through them on both sides for mounting in addition to the eyes and wire. An old auction label is at the center top of the back. Much of the paint has weathered with a significant loss showing that it was displayed outside for many years, perhaps on a boat. The original gilding on the entire eagle and much of the underlying gesso was lost over time and gold paint was later used that also had mostly worn away so that the entire upper section was re gilded and glazed. HERITAGE: This type of carving was done by sailors, and craftsman such as Bellamy and were an expression of the patriotic feeling in the country during the mid 19th Century. The eagle in this form was frequently used as decoration on the transom of American sailing ships. Recreations made by the Artistic Carving Company of Boston have been selling over the years in the $2000 to $8000 price range which is affordable considering the prices that a documented John Bellamy eagle will bring many thousands of dollars. Copyright 2012 by Land And Sea Collection™. All Rights Reserved. This fine carving of an American Eagle is in the style of Boston's Artistic Carving Company, Ca 1950 whose work resembled that of John Bellamy. Eagles were commonly used as the stern boards of many American sailing ships in the 19th Century. showing a U.S. Shield and gripping a cluster of arrows. It is the type of work seen in hand carvings of the mid 19th Century as done by sailors and other craftsman. The eagle in this form was frequently used to grace the sterns of American sailing ships. The most renown carver in his day was John Bellamy whose many works live on and are highly sought after. As evidenced by auction results, another highly desirable makera was the Artistic Carving Company of Boston, MA which operated from the 1850's to the last quarter of the 1950's. Recreations made by the Artistic Carving Company of Boston have been selling over the years in the $2000 to $7000 pricerange while which is affordable considering the prices that a documentes John Bellamy eagle will bring.